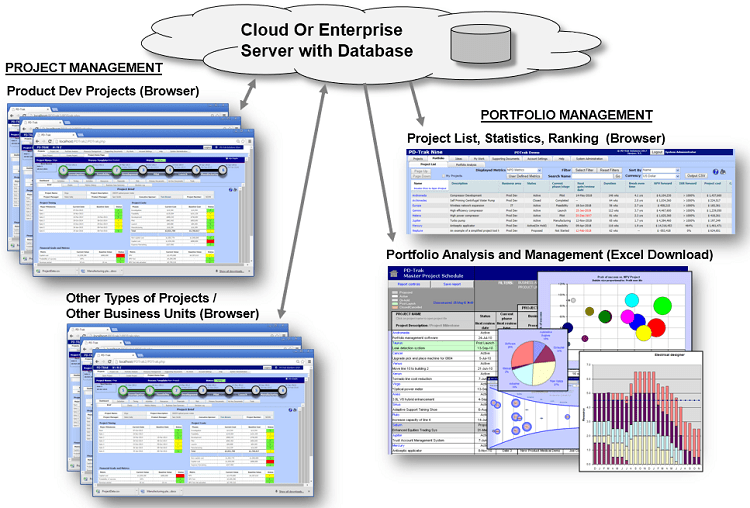 The PD-Trak Project Portfolio Management System uses a cloud based or internally hosted backend server with a browser based client side interface. The user interface is implemented as a combination of web pages and can include MS Excel® and MS Project® file download/uploads. These MS Office files can optionally run VBA code to handle data exchange with the database and to implement automation/data analysis. This architecture allows the system to be easily customized to meet specific customer requirements and allows users the flexibility of adding ad-hoc worksheets for project specific data analysis. Similarly, portfolio analysis reports can be generated using an MS Excel® download allowing portfolio analysis to be performed without a real time connection to the system. Data security is highly important and we have taken great care to ensure a high level of security and protection from encrypted communications with SSL, highly secure access authorization, malware protection, and regular off-site backup. Learn more. We offer several options on how our project portfolio management software can be hosted, both cloud-based and internally hosted. Each of these options has different advantages ranging from no need for internal IT support with our SaaS, cloud-based option to internal company hosting that offers the best option for integration with other company systems. Learn more.